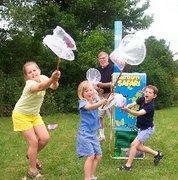 A delightful, outdoor fun, party game for kids as well as kids at heart. The unit propels colorful butterflies high in the air. As the light-weight butterflies float and flutter to the ground, kids scramble to catch the lifelike butterflies in the butterfly nets.